Tightrope walking – also known as funambulism – is one of the most extreme of all air sports. It involves walking on a very thin rope or wire, preferably at very high heights. Of course, it is regularly seen in circuses where circus artists do it in front of an audience. There are also many people who do it for publicity, trying to go as far as possible or as high as possible. Sometimes, in tightrope walking, they can use a balancing post. The most extreme version of this extreme sport is when it is done without a safety net or harness. Tight Wire – this is where the wire is tensioned and stretched between two points. Most will use a tool for balancing, although the most advanced people do it without any props. This is known as freehand. Generally, this is the style that is most often seen in circuses and other entertainment areas. High Wire – this is the most extreme form of tightrope walking. This is where the wire is stretched the same as tight wire, but is done at an extreme height. It can go as high as you want, but has to be at least twenty feet high. Slack Wire – this is the process whereby the tension is provided by the performer and his or her props. This style is often used by street artists. Skywalks – this is also often done at very extreme heights, usually between skyscrapers or large natural shapes. 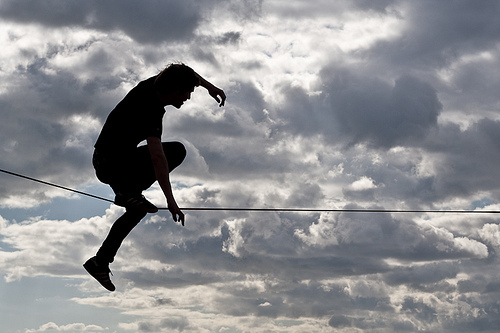 Slack Lining – this is similar to tight wire walking except the line is not as rigid. This means that it can stretch and bounce and has similar effects to a trampoline. Freestyle Slack Lining – this is also known as rodeo slack lining. This is a real art that allows swinging manoeuvres as well as static ones. Jultagi – this is classed as a cultural art in Korea. Uyghur Dawaz – a cultural art in China. If you are interested in taking part in tightrope walking, you may want to look for a role model for inspiration. Below are some of the most famous tightrope walkers known to man. Maria Spelterini was a woman who crossed the Niagara Falls on a tightrope – using a balancing pole – on the 4th of July 876. This feat was repeated several times by Charles Blondin, who also operated under the alias Jean François Gravelet. Willie Hunt, also known as the Great Farini, did the same. The Australian Con Colleano was known as the wizard of fire. He was the first person to achieve a summersault on a tight rope. Robert Cadman combined high wire walking with rope sliding. Pablo Fanque was the first black circus owner in the United Kingdom and received a mention in one of the songs by the Beatles. He was classed as a true rope dancer. Farrell Hettig set the record in 1981 for steepest inclined. The record for highest wire walk is held by Adil Hoshur from China. He also performs Uyghur dawaz, a traditionally Chinese form of high wire walking. His record was set at the Bird Nest Stadium in Beijing, where he lived on a wire for sixty consecutive days. These are but a few of the famous tightrope walkers, but there are many more. If this is one of the extreme sports that interests you, a visit to the circus may be in order to actually check the mechanics. Of course, there are also many street artists who are involved in this sport, particularly slack wire walking. Training groups can be found throughout the world and you could be tightrope walking before you know it. Have fun! This entry was posted in Bizarre, Tightrope Walking and tagged tightrope walking. Bookmark the permalink.